The Tiny Tiger & preschool martial arts program helps your child improve focus, discipline, and attention span. Tiny Tigers is an activity that will help develop a child’s social skills as well as assist them in preparing for their school age years.. Children who participate in Tiny Tigers will have positive interaction with children their own age, and they will make friends .Tiny Tigers is an activity that will help develop discipline. Martial Arts encourages Tiny Tigers to practice good behavior skills and set a good example for others. Tiny Tigers is an activity that will help develop a child’s basic motor skills, build coordination, balance, control and fitness as well as learn about important concepts such as stranger awareness. We strive at PA Karate to reinforce values children learn at home and assist in a child’s focus and learning process. Our kids martial arts program begins with our Tigers. We believe in building a strong foundation, and that begins with our Tigers group. Our program is predicated on focus, discipline, concentration, and developing a well rounded student. Your child will experience a modern, exciting, and fun curriculum while setting and reaching goals. In addition, each student will begin to develop basic Martial Arts skills, improve coordination and develop better fitness. We cater our program and adapt our teaching to each individual student instead of having each student adapt to our teaching. We feel this is fundamental to every child’s development. Our program is also adaptive and productive for any child with ADHD, Autism, or ADD. As your child grows and matures, so do our Martial Arts programs. We advance their instruction in Martial Arts and improve their level of skill, physical fitness, cooridination, balance, and self-defense. Our core principles and motivation remain constant. We emphasize focus, discipline, concentration, and developing a well rounded student. Your child will experience a modern, exciting, and fun curriculum while setting and reaching goals. Our Fit Kid Summer Camp has been designed with your child’s fitness and health in mind. We will help motivate and educate your child about the benefits of exercise and a healthy lifestyle. We make exercising fun and enjoyable while also helping your child feel good about themselves and improving their self-confidence. With weekly options available in 2018 as well as daily rates for schools holidays and service days, we have an offering that is perfect for every child and family that includes weekly field trips. 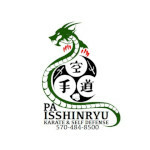 Get A Well-Rounded Experience With PA Isshinryu Summer Camp! We are now offering 8 weeks for this Summer. Limited space available, only 20 spots! Book now for your early bird discount! Your child will be introduced to aerobic activities they can perform at home with no equipment. They will be educated on how important aerobic activity is for a healthy lifestyle. Classes, taught by a certified personal trainer, will be rigorous, but rewarding. Strength Training: Your child will be instructed by a certified personal trainer and introduced to the use of light weights, resistance bands, and body weight resistance. Strength training will assist them in all physical activities through their journey in life. Your child will kick and punch their way into fitness! We will introduce your child to the world of martial arts, or advance the skills they currently have. This is an excellent cross-training activity that will also incorporate some self-defense. We will help your child understand the importance of stretching and how it helps the body repair, rejuvenate, and prevent injury. No friend or fast food here! We will have a certified nutritionist teach your child about the importance of a well-balanced diet and that healthy food and choices aren’t bad for you! Don’t wait until it’s too late! We’re booking spots now for our 2018 Fit Kid Summer Camp At PA Isshinryu Karate & Self Defense. And don’t forget to call about holidays and service days. We offer day camps based on the East Stroudsburg school system calendar. It’s easier than finding a daycare! Exciting improvements have occurred in our teen and adult program. We now offer our students the ability to earn their black belt in Isshinryu Karate as well as fast paced, challenging Kickboxing classes. Students can experience the best of both worlds, reaping the benefits and rewards Karate can bring to one’s life, and the physical fitness Kickboxing offers. Our modern, fun curriculum will have students eager for each class, while our emphasis on self-defense will enhance self-confidence. We offer a total package for Women and Men of any age! Try a different and exciting way to get in shape and learn self-defense…. Hyper Kickboxing! This fast paced, modern kickboxing class will leave adults drenched with sweat, full of energy, and ready for more. We will teach you the basic hand and kicking techniques and combinations, while improving your speed, agility, and coordination. Our Kickboxing classes will give you a fantastic cardiovascular workout and improve your strength. We focus on core, abs, legs, and more!!! It’s a great experience. Be part of something different and exciting! 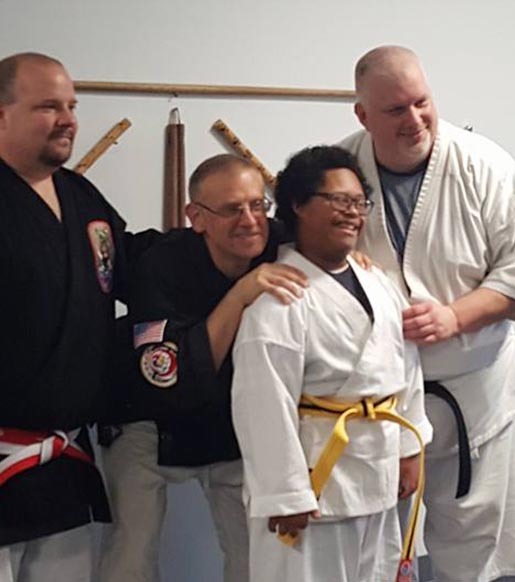 Enjoy all the benefits of the Martial Arts in our Warriors program, where students and adults with ADD, ADHD, Down Syndrome, SMA, Dyslexia, Mood Disorders and other learning difficulties can take advantage of individualized coaching from the best instructors in East Stroudsburg. The Warriors program at PA Karate is structured, methodical, and repetitive, creating the boundaries beneficial for Attention Deficit Disorder and the routine required by those with Autism, Aspergers, and Down Syndrome, and the discipline that creates success for everyone. We focus on YOUR child’s needs to achieve results are at a faster pace. The Warriors program is designed to view every child as an individual with individual needs, not an individual with special needs. There is no confidence like self-defense confidence. A Fun & Modern Martial Arts Training Experience for sparring athletes and students interested in self-defense that helps create respectful, humble, more powerful students. The Hyper Fight Club classes fuse martial arts sparring combinations, self-defense techniques and drills, plyometrics, combat sprints, sparring games, music, workshops and special events to inspire the world’s top martial arts athletes. 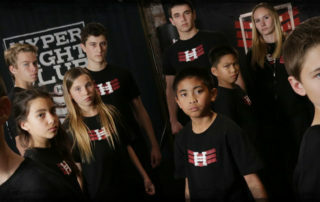 The Hyper Fight Club classes are a progressive sparring and self-defense curriculum that helps to form respected fight athletes who will stand up for themselves, their family and what they believe in. 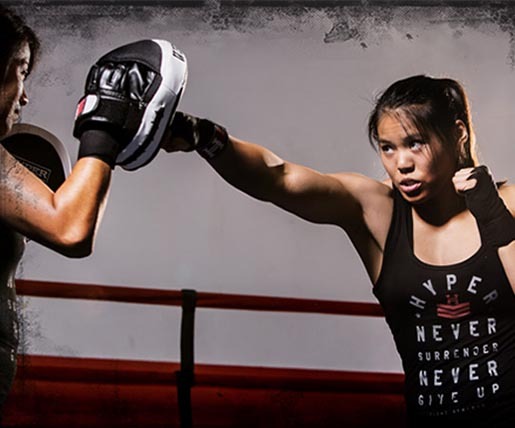 Hyper Fight Club classes are fast paced, explosive and exciting. Students will leave pumped up and dripping with sweat. Our classes will build strength, improve cardiovascular conditioning, and fill your spirit while having fun learning self-defense, hitting pads, sparring and training with friends. Fight Club is geared for youth, teens, and adults! 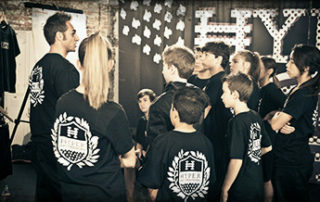 Enjoy the benefits of the Hyper Fight Club training sessions at any age. Youth and Teen members learn how to handle bullying issues and become anti-bullying advocates in their family and community. Partner up with a friend in class to challenge yourself with a awesome cross training drill. FIGHT CLUB IS THE WORKOUT YOU HAVE BEEN LOOKING FOR… Exciting and different! Hyper Fight Club members learn most relevant sparring combinations, drills, counters, tactical strategies and philosophies created by top fighters and coaches worldwide. This is a fun training experience that has students excited for more. 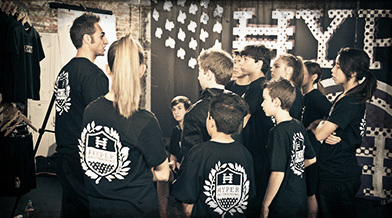 Our Hyper Pro Training classes combine a fusion of martial arts techniques, plyometrics, acrobatics, creative forms & weapons performances, music and special events to inspire the world’s top martial arts athletes. The Hyper Martial Arts plyometrics and training sessions create dynamic athletes. help create confident leaders with our The Hyper challenge weeks and performance weeks prepare athletes to perform anywhere anytime. Hyper Pro Training is a progressive training curriculum. Each we introduce a new kick, combination, or skill that helps mold our students into more explosive martial arts athletes. Our students will continuously improve their ability, discipline, focus, and confidence, while be amazed at what they are able to accomplish! Partner up with a friend in class to challenge yourself with a quick cross training drill. Feel Confident About Your Child’s After School With PA Karate Don’t spend another day worrying about where your child is after school. Join us today at PA Karate for the most different and exciting After School program in Bushkill and East Stroudsburg. You’ll rest easy knowing your child is spending the afternoon in a safe, structured environment and they’ll enjoy every minute of the exciting activities. We know the importance of your child getting their homework done before dinner and bedtime. That’s why we have designed an After-School Program that balances schoolwork with fun activities and games. Your child will get the best of both worlds. And they’ll be ready to settle down for the night when it’s time to go home. Don’t Stress Again About After School Transportation. As part of our After School Program, we’ll pick your child up and deliver them safely back to PA Karate for a great afternoon. Our After School program is offered 5 days a week and currently serves Middle Smithfield Elementary and East Stroudsburg Elementary. Or you can customize your package and choose just 2 or 3 days a week for your child to attend! Don’t see your child’s school on our list, ask about additional transportation options or current waiting lists. Give your child the best After School experience possible at PA Karate. We proudly serve students and families across Bushkill and East Stroudsburg and we can’t wait for you to join.